If you are the regular reader of SolveMyHow then you might had read my previous post i.e [Exclusive] Top 10 Best URL Shortener Tools / Websites. Those are the best URL shortener website but you can't earn money by using those URL shortener tools. Then how to make money ? So, that's why today I complied the new shortener tools and made the list of top 10 URL shorteners. By using these 10 websites you can easily earn money online. Don't worry you do not required any technical skills for using these websites. That's why it's one of the easiest way to make money online. How To earn money from shorten URL ? 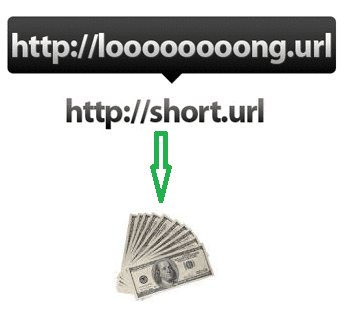 Basically, URL Shortening is a service which let you convert your long-ish url into short url on the click of button. So, just copy that short url and paste it anywhere you wanted. Now, whenever somebody click on that url. He/She will be redirected to one ad page (which can be skipped after 5sec) after that your web page will be displayed. So, in this way you will earn money and get paid i.e by showing ads. Isn't it simple and easy ? The priority will be top to bottom. So, kindly prefer top sites first. Adfly is one of the most used url shortening website for making money online. It pays you about $5 for 1000/clicks. The minimum payout is $5 which is better than other companies. The payout can be possible via paypal or payoneer. Its Google page rank is 4, while alexa rank is 121. Most of the people prefer Adfly because it is one of the old and most trusted company. LinksBucks is another best and recommendable site. Though it has pretty less payout rates then adfly. But adf.ly pays for only unique visitors clicks whereas linkbucks pays for all the visitors clicks. LinksBucks is another trusted url shortener website and had already paid $1.2 million dollars. The minimum payout of linkbucks is $10. Its Google page rank 5, while alexa rank is 551. LinkShrink is the another site which having high pay rates just like adfly. You can earn upto $5 for 1000/clicks. The minimum payout is $5 dollars via paypal. You can also earn 10% commission for referrals. Its alexa rank is 3838. AdFocus is another good paid url shorten site. You can earn $5 on US visitor's 1000/clicks. This site pays more money for US or UK visitor's. This site also have a advertiser programs for your website. It has Google page rank 3, while alexa rank is 3024. Shortest is the new company. It will give you average 4-7 dollars / 1000 clicks for US Visitors. The rates varies according to country wise. You can earn 20% commission for every referrals. The minimum payout is $5 dollars via paypal or payoneer. It has Google page rank 2, while alexa rank is 8901. Bc.Vc is very easy to remember and provides very short URL. It is modern URL Shortener site. It provides $4/1000 clicks and minimum payout is $10 via paypal. It gives you 20% commission for referrals. It is the trust worthy site like adfly and linkbucks. It has Google page rank 3, while alexa rank is 2025. Adlock is the new company. It pays you 1 to 5 dollars / 1000 clicks depends on the traffic coming from. Basically Adlock is the CPA and CPM based URL shorten service. This is sometimes very annoying for the users because instead of ads it will give the surveys to complete. The minimum payout is $5. It has Google page rank 1, while alexa rank is 172,413.
p.pw is very responsive site and having a very good dashboard. It will give very short URL, plus it is very easy to remember due to short name. p.pw gives you 1 to 3 dollars / 1000 clicks. The minimum payout is $5. It has Google page rank 1, while alexa rank is 29,123.
snip.ps is the US based company and that's why provides hige rates for unique US visitors. It pays you about 2 to 5 dollars / 1000 clicks while minimum payout is $10 via paypal. It has Google page rank 3, while alexa rank is 2,095,190. Ysearch is the new URL Shotening site. This site pays $5 / 1000 clicks and minimum payout is lesser than every other URL shortener company. The minimum payout of Ysear.ch is $2.50 via paypal. You can also earn 20% commission for referrals. This site also has advertising banners. The alexa rank of Ysear.ch is 6381. So, these are the top 10 best url shortener websites to make money. Go Ahead and try 2-3 sites and earn money. I hope you found this article worth reading. Please don't forget to share it with your G+ and twitter social media friends. In the mean while, do let me know which is your favorite paid URL Shortener site ? Well, Glad to help you ! I'm glad to help you and thank you for your kind words. This really inspires me. Well, true said "shorte.st" has good payout rates + referral programs. I have some sharable links where i stored some coding snippets on "box.com" can i add this urls in "adf.ly" and make some money by adding short urls on my blog ? Yes you can add. There is not any problem in that. Even you can share those links in your facebook groups, twitter, Google plus etc social media sites to get more and more clicks. The site is opening properly. After you said I tested the same thing and yes even I'm facing the same problem. Even their contact page is banned/blocked. Sagar in this case you can try linkbucks and linkshrink which are equally as good as adfly.